MANDARINA DUCK BAG. A very high quality large tote/shoulder bag in orange leather. Genuine of course, features all usual labels etc, see photos. Zip section and small pockets on inner. MANDARINA DUCK MD20 Crossover Zip S Mara Red. • Fabbricante: MANDARINA DUCK. sicuro e conveniente. Schließen Weiter Zurück. • Colore: Mara Rosso (Red). • Materiale: Esterno 100% poliestere, interno 100% poliuretano. Mandarina Duck MD 20 Shoulder Bag cinch top in iridescent purple. Free shipping! 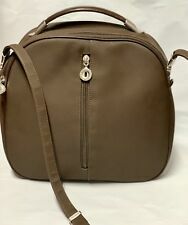 Authentic Mandarina Duck MD20 shoulder bag with cinch top and zipper compartment at bottom. Iridescent purple. 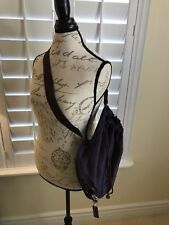 Shoulder strap is adjustable, can be worn cross body or simply over the shoulder. Extremely clean in and out, no blemishes. See photos. This is a really pretty, special fun bag! Check out our other listings! Free shipping! Made of sturdy polyester, main pocket closed by zip, adjustable shoulder strap, front pocket. Pocket for small objects and pocket closed by zip inside. Capacity (l) No problem! MANDARINA DUCK. • Manufacturer: MANDARINA DUCK. Diaper Bags. Trolley / Suitcase. Clutch / Evening Bags. Shoulder Bags. Cross Body Bags. Laptop Sleeve. Made of sturdy polyester, main pocket closed by zip, adjustable shoulder strap, front and side pockets. Pocket for small objects and pocket closed by zip inside. No problem! Other Views. We will respond you within 12 working hours. ❤ ITALYSHOP24.com presents ❤Mandarina Duck fusion ladies of tote bag shoulder bag of CrossOver 2ZT04030 34 x 27 x 10 cm. 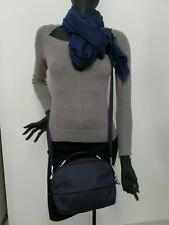 Shoulder bag Mandarina Duck MD20 MTT5. Made of sturdy polyester, main pocket closed by zip, adjustable shoulder strap, front pockets. Pocket for small objects and pocket closed by zip inside. Keyring included. Made of sturdy nylon, main pockets closed by zip, adjustable shoulder strap, front pocket. Pocket for small objects and pocket closed by zip inside. No problem! Height (cm):36. • Fabricant: MANDARINA DUCK. • Couleur: Lilly White (Blanc). Schließen Weiter Zurück. • Matériel: 100% polyester. Prêts à être expédiés. Im Hauptfach 1 Zipperfach und 1 Einschubfach. Die MANDARINA DUCK Umhängetasche ist außerdem mit einem Schlussanhänger ausgestattet. MANDARINA DUCK MD20 Small Zip Crossover Taupe. nach Farbe filtern. Auf der Rückseite 1 Einschubfach mit Klettverschluss. Die MANDARINA DUCK Umhängetasche ist außerdem mit einem Schlussanhänger ausgestattet. MANDARINA DUCK Umhängetasche mit Anhänger. Umhängetasche wird mit Zipper geschlossen. Shoulder bag Mandarina Duck MD20 MTV1. Made of sturdy polyester, main pocket closed by zip, adjustable shoulder strap. Pocket for small objects and pocket closed by zip inside. Keyring included. Capacity (l). MANDARINA DUCK Duplex 2.0 Small Crossover Black. • Manufacturer: MANDARINA DUCK. • Material: Outdoor full-grain cowhide, inner polyester, to. • Color: Black (Black). All prices incl. Item number: 162NGM01 651. Shoulder bag Mandarina Duck MD20 MTT4. Made of sturdy polyester, main pocket closed by zip, adjustable shoulder strap, front pocket. Pocket for small objects and pocket closed by zip inside. Keyring included. 49"/124 cm in max position, one part of the strap could be removed to make shoulder strap approx. 20"/51 cm long. See photos for more information. • Couleur: Phlox Rose (Rose / Rose). • Fabricant: MANDARINA DUCK. Schließen Weiter Zurück. • Matériel: En dehors de 100% Polyester. Prêts à être expédiés. • Fabricant: MANDARINA DUCK. confortables et sûres. Schließen Weiter Zurück. • Couleur: Robe bleue (bleu). • Matériel: En dehors de 100% Polyester. Prêts à être expédiés. MANDARINA DUCK MD20 Small Crossover Pirite. • Manufacturer: MANDARINA DUCK. • Color: Pirite (Brown). • Material: Outside polyester, inside polyurethane coating. All prices incl. Item number: 14116MM3 024. • Manufacturer: MANDARINA DUCK. • Material: Outside 100% polyester, inside 100% polyurethane. • Color: Black (Black). Fast and friendly service. All prices incl. More than 1 mio. Wide choice - fair prices. 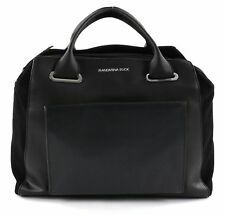 MANDARINA DUCK MD Lifestyle Tablet Crossover with Flap Black Ink. • Fabricant: MANDARINA DUCK. confortables et sûres. Schließen Weiter Zurück. • Couleur: Encre noire (Noir). • Matériel: En dehors de 100% polyester, à l'intérieur de 100% de polyuréthane. • Fabbricante: MANDARINA DUCK. • Colore: Nero (Black). Schließen Weiter Zurück. • Materiale: Esterno 100% poliestere, interno 100% poliuretano. Shoulder bag Mandarina Duck Hunter VCT05. Made of sturdy nylon, main pockets closed by zip, adjustable shoulder strap, front pocket. Pocket for small objects and pocket closed by zip inside. Capacity (l). Linea MD20. Zaino Mandarina Duck. Colore dress blue. Spallacci regolabili. Cerniera e tasche interne. Chiusura con cerniera. Shoulder bag Mandarina Duck MD20 MTX6. Made of sturdy polyester, main pocket closed by zip, adjustable shoulder strap, front pockets. Pocket for small objects and pocket closed by zip inside. Expansions zip. Made of sturdy polyester, main pocket closed by zip, adjustable shoulder strap, front and side pockets. Pocket for small objects and pocket closed by zip inside. No problem! MANDARINA DUCK MD20 Crossover Zip S Miaty Rose. • Fabbricante: MANDARINA DUCK. sicuro e conveniente. Schließen Weiter Zurück. • Colore: Miaty Rose (Beige / colore rosa). • Materiale: Esterno 100% poliestere, interno 100% poliuretano. Zaino donna Mandarina Duck MD20 MTT1. Zaino realizzato in robusto poliestere mitrix, materiale distintivo del marchio Mandarina Duck. Ampia tasca principale chiusa da zip, organizzazione interna con tasche per piccoli oggetti. MANDARINA DUCK MD20 Crossover M Black. • Fabricant: MANDARINA DUCK. • Couleur: Noir (Black). Schließen Weiter Zurück. • Matériel: polyester extérieur, à l'intérieur de polyuréthane. Prêts à être expédiés. • Manufacturer: MANDARINA DUCK. • Color: Dress Blue (Blue). • Material: Outside 100% polyester, inside 100% polyurethane. Top quality. Fast and friendly service. All prices incl. Wide choice - fair prices.